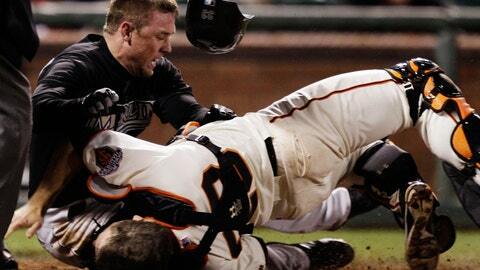 Collisions like this, which ended Buster Posey's season in 2011, hace spurred the move to ban them. LAKE BUENA VISTA, Fla. (AP) – During his 13-year career as an All-Star catcher, Mike Scioscia earned a reputation for being as tough as anyone when it came to blocking home plate. But in a sport filled with nostalgia, even Scioscia wouldn’t mind seeing a few modifications. "I think everyone is in agreement that the mindless collisions at home plate where a catcher is being targeted by a runner, that needs to be addressed," the Los Angeles Angels manager said. "When I was growing up as a kid in Philadelphia, it was a badge of honor. You were expected to hang in at the plate, and the runner was expected to do everything he could to tag the plate. We’re going back 40 years ago, but the mindset has changed a bit." Major League Baseball said Wednesday it intends to eliminate home plate collisions by 2015 at the latest. Pete Rose, who famously flattened Ray Fosse to score the winning run in the 1970 All-Star game, was bowled over. ”What are they going to do next, you can’t break up a double play?” Rose said in a telephone interview with The Associated Press after MLB announced its plan Wednesday. The players union declined comment, pending a review of the proposed change. Some players spoke up on Twitter. ”No more home plate collisions?! What is this? NFL quarterbacks are catchers now?” Oakland outfielder Josh Reddick wrote. ”Nothing better than getting run over and showing the umpire the ball. Please don’t ban home plate collisions,” Pittsburgh rookie catcher Tony Sanchez posted. ”Totally disagree,” added retired catcher John Flaherty, now an analyst with the Yankees’ YES Network. Former catchers Joe Girardi, Bruce Bochy and Mike Matheny, all now managing in the majors, attended Wednesday’s meeting. ”I don’t think it’s completely sparked by anything that’s happened in baseball as much as what’s happening outside of baseball and how it’s impacting people and impacting the welfare of each sport,” said Matheny, now managing the St. Louis Cardinals.